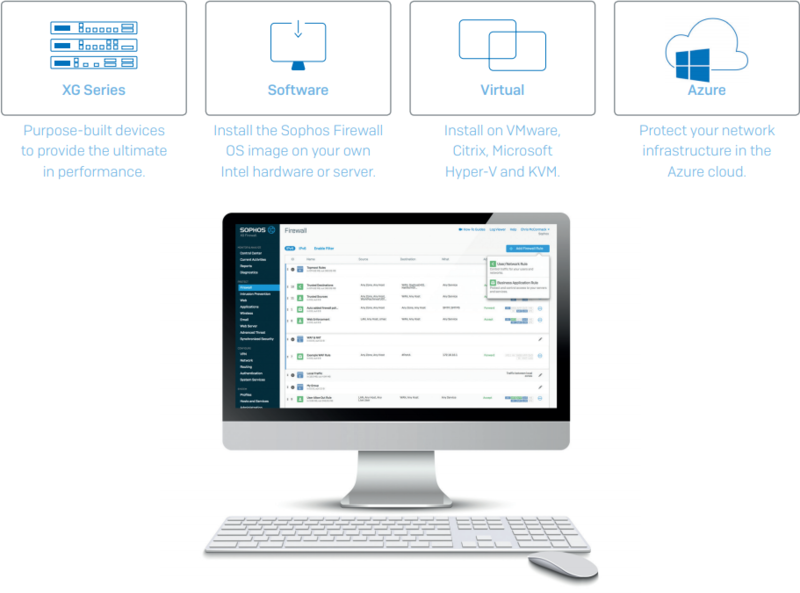 Sophos XG Firewall provides all the latest advanced technology you need to protect your network from ransomware and advanced threats including top-rated IPS, Advanced Threat Protection, Cloud Sandboxing, Dual AV, Web and App Control, Email Protection and a fullfeatured Web Application Firewall. And it’s easy to setup and manage. We’ve engineered XG Firewall to deliver outstanding performance and security efficiency for the best return on your investment. Our appliances are built using Intel multi-core technology, solid-state drives, and accelerated in-memory content scanning. In addition, Sophos FastPath packet optimization technology ensures you’ll always get maximum throughput. Pre-defined policy templates let you protect common applications like Microsoft Exchange or SharePoint quickly and easily. Simply select them from a list, provide some basic information and the template takes care of the rest. It sets all the inbound/outbound firewall rules and security settings for you automatically – displaying the final policy in a statement in plain English. The Sophos User Threat Quotient (UTQ) indicator is a unique feature which provides actionable intelligence on user behavior. Our firewall correlates each user’s surfing habits and activity with advanced threat triggers and history to identify users with risk-prone behavior. Unlike our competitors, whether you choose hardware, software, virtual or Microsoft Azure, we don’t make you compromise – every feature is available on every model and form-factor. We’re pleased to announce that the early access program (EAP) for XG Firewall management through Sophos Central is now available for you to take a test drive. First, you’ll need a Sophos Central account if you don’t already have one. Head on over to cloud.sophos.com to create a trial account or login, and while you’re there, enroll in the Early Access Program by clicking your account in the upper right corner of the console. Then, return to Sophos Central and confirm adding your Firewall. That’s it! 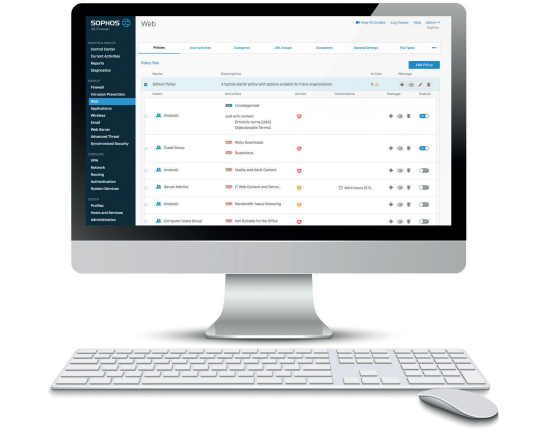 Now you can securely access your firewall from anywhere through Sophos Central. 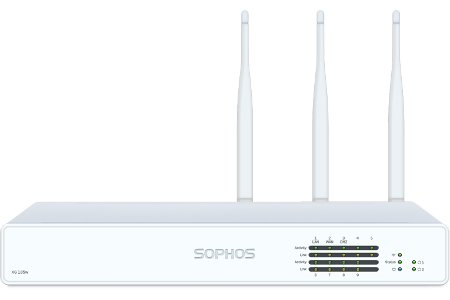 All healthy Sophos endpoints will isolate any compromised system, providing isolation at the endpoint level, and preventing any threat from moving laterally – even on the same broadcast domain or network segment. In addition to Lateral Movement Protection, there’s a variety of new features focused on protection, flexibility, networking and management. Synchronized Security – lateral movement protection – extends our Security Heartbeat™ automated threat isolation to prevent any threat from moving laterally or spreading across the network, even on the same subnet. The firewall instructs all healthy endpoints to completely isolate any unhealthy endpoints. Synchronized User ID – utilizes Security Heartbeat™ to greatly streamline authentication for user-based policy enforcement and reporting in any Active Domain network by eliminating the need for any kind of server or client agent. Education features – such as per-user policy-based control over SafeSearch and YouTube restrictions, teacher enabled block-page overrides, and Chromebook authentication support. Email features – adds Sender Policy Framework (SPF) anti-spoofing protection and a new MTA based on Exim, which closes a couple of top requested feature differences with SG Firewall. IPS protection – is enhanced with greatly expanded categories enabling you to better optimize your performance and protection. Management enhancements – including enhanced firewall rule grouping with automatic group assignment, and a custom column selection for the log viewer. VPN and SD-WAN failover and failback – including new IPSec failover and failback controls and SD-WAN link failback options. Client authentication – gets a major update with a variety of new enhancements such as per-machine deployment, a logout option, support for wake from sleep, and MAC address sharing. 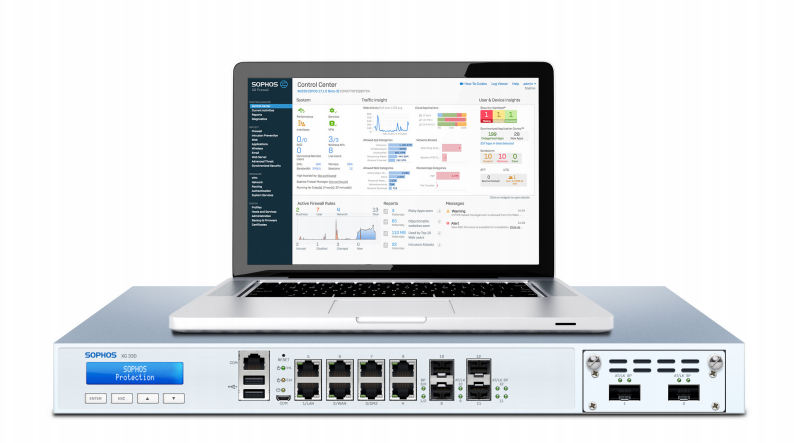 Sophos Connect – is our new IPSec VPN Client, free for all XG Firewall customers, that makes remote VPN connections easy for users, and supports Synchronized Security. Wireless APX access point support – provides support for the new Wave 2 access points providing faster connectivity and added scalability. Airgap support – for deployments where XG Firewall can’t get updates automatically via an internet connection (due to an “airgap” or physical isolation), XG Firewall can now be updated via USB. Instant identification and immediate response to today’s most sophisticated attacks. Multi-layered protection identifies threats instantly and Security Heartbeat™ provides an emergency response. 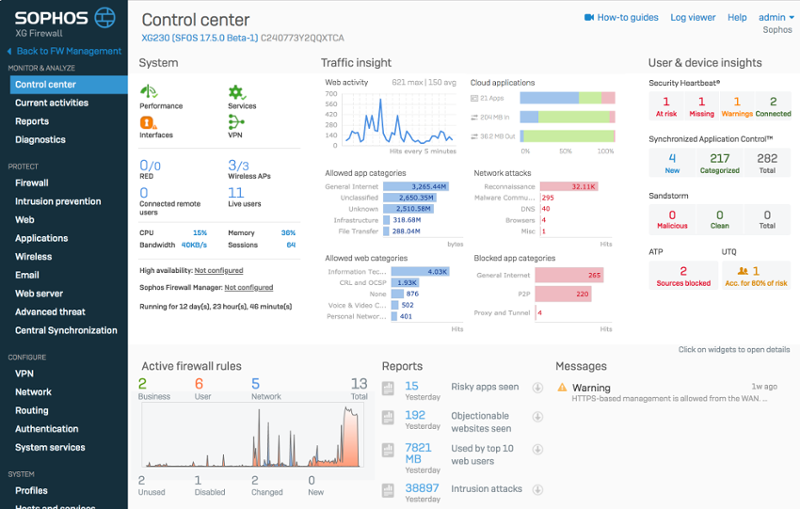 Unmatched visibility and control over all your user’s web and application activity. 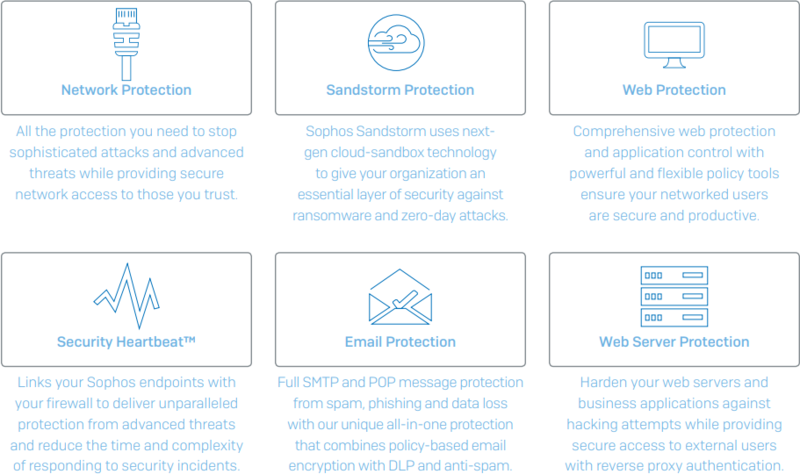 An industry first, XG Firewall integrates Deep Learning technology into our Sophos Sandstorm sandboxing. It delivers the industry’s best detection rates without using signatures. It catches previously unseen malware lurking in suspicious payloads quickly and effectively. User authentication is critically important in a nextgeneration firewall but often challenging to implement in a seamless and transparent way. Synchronized User ID eliminates the need for client or server authentication agents by sharing user identity between the endpoint and the firewall through Security Heartbeat™. It’s just another great benefit of having your firewall and endpoints integrated and sharing information. Our XG Series hardware appliances are purpose-built with the latest multi-core Intel technology, generous RAM provisioning, and solid-state storage. Whether you’re protecting a small business or a large datacenter, you’re getting industry leading performance. *Get one (1) FREE XG 135 Wireless hardware appliance!